Ignacio’s nominations were nearly enough to be a post in itself! They were very enthusiastic telling of his commitment to his neighbors as well as his love of gardening. It was a pleasure to meet such a loved, long-standing member of the Hyde Park community. Where are you from? How did you make your way to Hyde Park? I was born and raised in TX, but I moved to Minneapolis when I was 16 - I went to school there. I’m used to this weather! I opened my business on the East Coast when I was in my 20s. I moved to the South End then lived a couple years in Maine and I loved it but my partner hated it! I was like, “I’m not going back to a building; I need a house!” But at the time I couldn’t really afford to live right in the city so the house I ended up buying in Hyde Park 20 years ago was a gut job. Where I live is a private way - my neighborhood is fantastic! We went through such a hard time too [with our health] and my neighbors were unbelievable. They came and helped clean, they cooked for us - they were fantastic! I only had a 2x2 plot in front of my South End building for gardening, so when I moved to Maine I became a major gardener. When I ended up buying this house I was really interested in beautifying the place; I taught a lot of my neighbors about gardening. I belong to the Neighborhood Association, and I try to help out and keep an eye out for everybody. Where do you see the need for help in Hyde Park? I think the trash from the convenience stores - lottery tickets etc. is really bad. I think some trash is starting to be picked up. You see a trash can, but then it’s full. The other issue is the parking situation, especially with the Fairmount train station. Similar to the South End, if you don’t live there, you can’t park there. Why can’t we be the same way? It’s hard to find a parking spot, but I live here! "We moved to Hyde Park last February after living in Roslindale for 13 years. We were sad to leave a district with lots of choices to eat from and having the Arnold Arboretum up the street. However, our neighbor Ignacio Benavides welcomed us to our new neighborhood with open arms and made sure to let us know all Hyde Park had to offer! Therefore I would like to nominate "Ignacio Benavides" who keeps our street clean as well as picks up litter everyday during his 5 to 10 mile walks all around Hyde Park. Ignacio has an oasis of a garden in his back yard that makes you feel as if you were in Cape Cod. Ignacio makes it a point to garden not only his home, but also for the neighbors on our street. Last summer Ignacio purchased tickets to last year's "HP150" event for the entire street. As he stated, "we should all support any Hyde Park event, we live in a beautiful community let’s keep it that way and try to make it even better." Ignacio makes it a point to have the neighbors get together in HP's local establishments not only to support them, but to have us appreciate and acknowledge the beauty of Hyde Park. Ever since we moved into the neighborhood we meet up for dinner once every other month during the winter, and frequently during the warmer season for either lunch or dinner to appreciate new Hyde Park restaurants." Nominate yourself or someone in the community for a future Humans of Hyde Park story; nominees can remain anonymous in the story or use their first name only if they prefer: https://goo.gl/forms/qgTj1Rh8t2bSbh973. ​How can a Facebook page help keep Hyde Park beautiful? When it contributes to sustainability by keeping perfectly good yet unwanted items out of landfills, AND, in the process, helps build friendships and a sense of community. Amanda Coen and Diana Ferrara had an idea for the page and turned it into a reality with Give & Get in Hyde Park. As if that wasn’t enough, they also started the Hyde Park Snowball Fight, spreading holiday cheer throughout the community! Amanda and Diana are perfect examples of the impact each and every one of us can have when we have an idea to “beautify” our community and then act on it. How long have you lived in Hyde Park? Diana- My whole life minus a few years in my early twenties. Amanda- I grew up in West Roxbury and have live in Hyde Park almost 2 years. How did you get the idea to start the Give & Get in Hyde Park (formerly Buy Nothing Hyde Park) Facebook group and how did you get it started? Diana- I came across Buy Nothing on a mom blog that I follow and decided to look into it. I really liked the idea of being part of a community where real people would use the things I no longer wanted, so I looked for a local group. The closest group was Roslindale, but because I did not live in that zip code they would not let me join. So, I decided to be the local admin for Hyde park and start the Facebook group. What was/is your vision for the group? What are the benefits of this kind of community forum? ​In what ways has Give & Get been successful? In what ways has it been challenging? 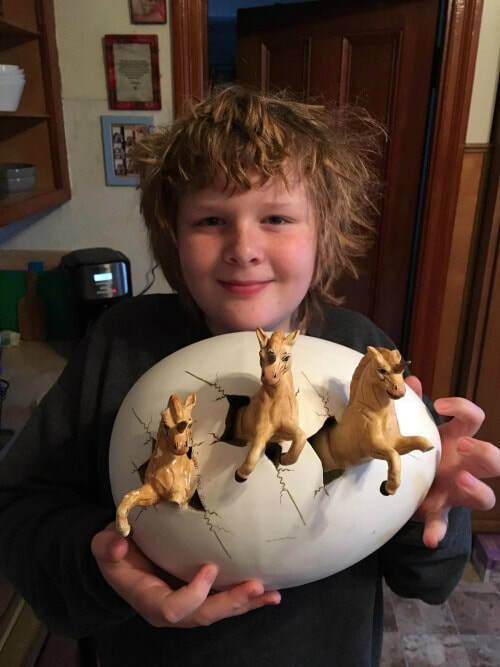 The page has been successful in having a growing group of members who work together to move things from homes where they are underused to homes that will appreciate them. It seems easier for people to get rid of things when they know they are going to a loving home within their community. We feel like connections in the community have been made that wouldn't be made without this group. One challenge is helping members adhere to the free stuff philosophy and not selling items or recommending stores when items are requested. We would also like to think of a way to encourage people to give to each other face-to-face instead of the porch pick-up pattern that is most common. We have found it challenging to manage the personal issues that arise because we are both busy moms and not always on Facebook. We try to keep the page as drama free as possible and this can be challenging when we are busy ourselves. You recently changed the name of the group and took it outside the "Buy Nothing" network. What were your reasons for doing so? The Buy Nothing Group founders focused solely on a philosophy of micro-local giving where you could eventually have groups in such a small area that direct neighbors would be the only people in a single forum. This philosophy proved problematic in many ways, the biggest of which has to do with making groups smaller makes them more racially and socioeconomically divided. The founders, who lived on a small island off of Seattle, were forcing Boston neighborhood groups to split along lines they drew based on street patterns and not based on already built communities. We did not want Hyde Park to be split at all, because we are one terrific community all together. We felt it was best to keep the rules and guidance coming from someone within our community rather than listening to leadership from a person who had never been to Hyde park, let alone understood what our community needed. We still focus on the local aspect of sharing, but we have expanded our philosophy to think about reducing waste, helping the community, and bringing the amazing diverse members of our community together. What are your future plans for the group? Have you considered expanding the scope, or are you happy with it the way it is? We are happy the way it is, but we would love to have events where people in the group could come together. We dream of hosting a “buy nothing yard NOT sale” where members can have blankets or tables of things and everyone in the community is invited to come and get what they want or need. It would be a great way to bring our community together and have a big trade off of things. Aside from managing this group, are the two of you involved in the community in other ways? We have both tried to bring toddler and baby activities to Hyde Park through art classes and playgroups at the Community Center with the help of Michelle Consalvo. The playgroup is on Wednesdays from 9:30-11am at the Muni and we would love to see new faces there! (This is actually how we met and became good friends and now our daughters Isabella & Julia are best friends!) Diana is involved in the Roosevelt School Parent Council where her middle child attends school, and Amanda teaches part-time at the Boston Renaissance School. Diana is the friendly face from Antonio’s Bacaro where she works part-time. She also spearheaded the first Hyde Park Touch-a-Truck event two years ago alongside Pat Tierney and Brian Allieri and then continued it as part of the family day event for Hyde Park’s 150th celebration. We also came together to start the Hyde Park Snowball Fight where we gifted small surprise gifts to 12 houses throughout Hyde Park in hopes that those people could also gift to members of our community creating a snowball effect and bringing a little holiday cheer into our community. Wow, I had no idea the two of you were behind the Snowball Fight! That was such a great idea and it really contributed to the “beauty” of living in Hyde Park! What advice do you have for others who might have an idea that could benefit the community? We wanted to do something nice for the community during the holiday season and who doesn’t want a tiny little gift on their doorstep to spread the holiday cheer? If you have an idea, just go for it! This is a great, accepting community and anything you do will be embraced and enjoyed by those around you. You may recognize Steve Nilson from the Hyde Park YMCA, where he is director of operations. 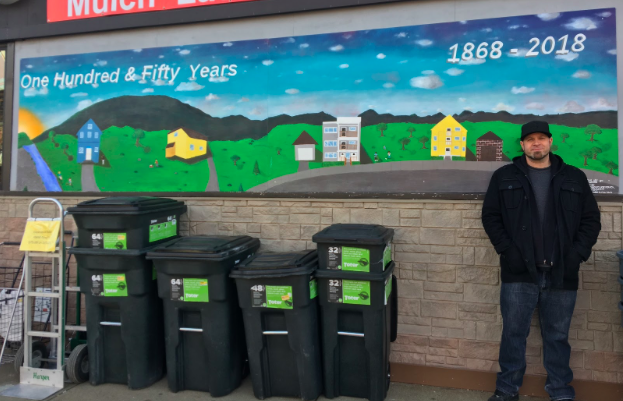 Steve is also a teacher, mentor, and talented artist who helps keep Hyde Park beautiful through his various efforts in the community, including the new mural on the front of True Value Hardware (pictured above). Read about all the ways Steve contributes to the beauty, vitality, and positivity of our community in this month’s Humans of Hyde Park feature. What is your connection to Hyde Park? I am a Hyde Park resident and have lived here for about 13 years. I have been working at the Thomas M. Menino YMCA in Hyde Park for the past 16 years. Additionally, I’m a member of The Switch Co-Op, which is a non-profit, volunteer led Artist Co-Op in Hyde Park. I grew up in Roslindale, which is the next neighborhood over, so have always been familiar with Hyde Park and spent a lot of time here growing up. What do you like best about the community? I love the diversity here in Hyde Park. Seeing people from all different backgrounds coming together is amazing. We are also very fortunate to still have plenty of green space in our neighborhood. The improvements that were made along the bike path that runs through the MBTA station in Mattapan Sq. and out to Dorchester have been amazing. Seeing so many families and people taking advantage of this public space to exercise and come together is beautiful. I love that we have a strong art scene here, and it seems like it is continuing to grow. In general, in my opinion and experience, there has been plenty of positive change that has taken place here over the past decade or so. There are a lot of people that are very passionate about Hyde Park that are doing great things for the community. In what ways do you involve yourself with the community? Last year presented a lot of incredible opportunities, especially with Hyde Park celebrating its 150th birthday (HP150). I’ve also been strongly connected to and involved with the community through the work I do at the YMCA and from volunteering at the Switch Co-Op. I was fortunate to have had a unique opportunity come up in 2018 where a local Boston Public High School in Hyde Park, Boston Community Leadership Academy, was looking for an art teacher. I’ve always wanted to teach art to youth, so I said yes immediately. This allowed me to do what I was passionate about doing while fulfilling a community need, and it was an incredible experience. Teaching ended up leading to me working with some of my students in creating the HP150 mural that is currently installed on True Value Hardware on River St., which was yet another dream of mine that was accomplished. I was the co-chair of the HP150 Arts Committee and got to work with some awesome people and we ran some great events last year. Lastly, I try to make it out to as many community meetings and events as possible. I feel it is important to show up, support, and get involved where you can. What efforts have you made (or been involved with) to make Hyde Park clean, green and beautiful? Each year we do several clean-up days at the Y and work with some of our major partners in recruiting volunteers to come out. We have also done projects in the past called “Togetherhood”, which is volunteer led and focuses on having a positive impact on the community. A big focus of the work that we do at the Y is getting youth connected to positive adult role models. It is important that we identify where we can help to cultivate and instill positive, life-long values through meaningful relationships with those that come through our doors. I believe that this will lead to increased awareness and a sense of community-ownership over our neighborhoods from residents long-term. I would like to think that being involved with the arts and getting others involved, including the mural we painted for True Value, adds to the overall beauty of the neighborhood. I would love to do more projects like that in the future in addition to participating in more clean-up events. Tell us about your artistic background. How did you learn to paint murals? How do you share that talent and experience with others? I’ve been drawing for as long as I can remember. It was something I just had a natural interest in and really enjoyed doing. To be able to take something that is just a thought in your head and sort of “transfer” it onto a surface by drawing or painting it still amazes me. It was a great hobby that allowed me to get creative and produce tangible work where I was basically competing against myself and holding myself accountable to improving. I used to put VHS-tape cartoons and video games on “pause” when I was young and would try to draw the characters. I would also draw the names of hip-hop groups and bands that I listened to, which led to me being pretty obsessed with forming letters. I never stopped drawing and it transitioned into learning more about using color schemes, painting, and using all different kinds of mediums. All of this led into creating larger-scale paintings and pieces of artwork, and then some mural opportunities came my way that I took on with no hesitation. I have a great group of artist friends, and it’s awesome sharing work with each other, exchanging honest feedback, and growing together. I enjoy collaborating with others and learning from each other. Being involved with The Switch has also been super helpful with building, sharing, and growing as an artist and stepping further outside of my comfort zone. As far as sharing my experiences with others, the top things that come to mind are: Teaching at BCLA allowed me to provide instruction to a high school class where everyone got to complete their own work of art. I’ve been working on art-related projects at the Y for well over a decade now. I try to positively promote art to almost everyone I come in contact with. There were so many events last year I was involved with that showed people some of the basics of art that they can take with them and apply to future creations if they’d like. Even just showing someone art can spark creativity or inspire someone else. To me, it is important that we do what we can to keep art alive so that it continues to grow and evolve. I also love making art for others. Even if they are not an artist themselves, people really seem to enjoy art as gifts. It’s one-of-a-kind and comes directly from what’s inside of a fellow human being, you know? I would strongly encourage folks that if you have a passion for something (that’s healthy of course), keep at it and make sure it doesn’t get lost in the day-to-day craziness that life can bring. Nothing feels better than being productive and being happy with what you bring to the world. Cathy Horn started Keep Hyde Park Beautiful in May of 2017. 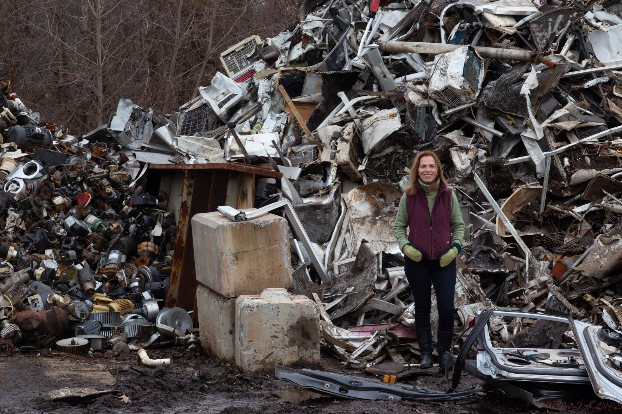 Since then it has become one of Hyde Park’s most visible groups, working with Hyde Park Main Streets, The Neponset River Watershed Association, Keep Massachusetts Beautiful and others, taking the lead or adding strength. She is a bit shy and surprisingly soft spoken, and a testament to how one person can make a difference. How long have you lived in Hyde Park, and what do you like most about our community? My husband and I bought our house here about 15 years ago. We chose Hyde Park because we wanted to be on a commuter rail line into Back Bay Station, and Hyde Park was the most (or only) affordable option. I love it here! It feels like a small town, but it’s only 15 minutes away from the city center (by train). I think Hyde Park is an undiscovered gem. There’s so much I’ve come to appreciate about the community - it’s diversity, all the green space and parks, the history, the beautiful old houses. I’ve also met a great group of people who are committed to Hyde Park and who volunteer their time and effort to make it a great place. Being a part of that network really makes this feel like home. Was there a seminal moment when you realized that you wanted to start Keep Hyde Park Beautiful? Or was it an evolution, the result of an inevitable progression? It was definitely an evolution that was a result of a series of seminal moments. It started when I began noticing a lot of litter around Hyde Park. (I swear it wasn’t like this when I moved here 15 years ago.) Once I noticed it, I couldn’t un-notice it! It was everywhere. It really started gnawing at me, so much so that my husband and I talked about moving out of the area. Problem is, the litter issue isn’t just in Hyde Park; it’s everywhere now. We are surrounded by trash, and that’s not the way I want to live. I think I deserve better. I think this community deserves better. I think the Earth that sustains us deserves better. I decided I didn’t want to sit around and complain any longer. I’ve spent too much of my life being passive. I decided to do something...anything...to try to make a difference. I wrote letters to Mayor Walsh and Councilor McCarthy, I researched the issue and gave speeches about it to my Toastmasters group, I joined the Hyde Park Main Streets board and worked with former Executive Director Emily Patrick on a couple of initiatives. The turning point came a few years ago when I started a litter patrol group in my neighborhood, the Wakefield-Washington section of Hyde Park. We now have a small group that meets regularly to clean up our immediate neighborhood. There was an unintended outcome to the litter patrol group: it created a sense of community and friendships developed. To be honest, that’s why I decided to start Keep Hyde Park Beautiful, to extend the benefits derived from my neighborhood litter patrol group to all of Hyde Park. How did the councilor and the mayor respond? I sent my letter to the Mayor first and never heard back. I sent the same letter to Tim McCarthy and he got back to me within a day with a very thoughtful and supportive response. I haven’t spoken to him about it since, but I’m hopeful that he will be a good ally in our future efforts. One person who has been tremendously helpful is Bryan Flynn from the mayor’s Office of Neighborhood Services. He’s my go-to guy! Sorry, Bryan! What are your immediate goals for Keep Hyde Park Beautiful? Your long term goals? I would like Keep Hyde Park Beautiful to become more than a group; I would like it to be part of a movement that inspires people to do what they can to make our community a beautiful place to live, work, study and play. I see the beauty as being both literal (as in how the community looks) and also figurative (neighbors helping neighbors, and working together to foster a sense of community and community pride; celebrating everything that is special about Hyde Park.) When we appreciate the good, the good appreciates! The KHPB team also has tangible goals in mind...lots of them. We’ve talked about starting a sponsor-a-spot program to beautify pocket parks and street median planting beds (similar to the program they have in Dedham). We’re discussing a partnership with Southwest Boston CDC to create an anti-littering campaign that will speak to the wide demographic within Hyde Park. We’d also like to identify a few beautification projects and get them “shovel ready” so we can apply for funding through various grant programs. As a community I would love for us to have a list of projects that are planned, vetted, and ready to go. This past year has been frustrating; certain grant opportunities have come to our attention and we haven’t been able to find a single project that was fleshed out enough to qualify. Another goal is to get more young people involved by partnering with area schools and youth groups. Do you have a favorite event? What was your most successful event this past year? Your biggest disappointment, event or otherwise? I don’t really have a favorite, I think all of our events have been successful in some way. 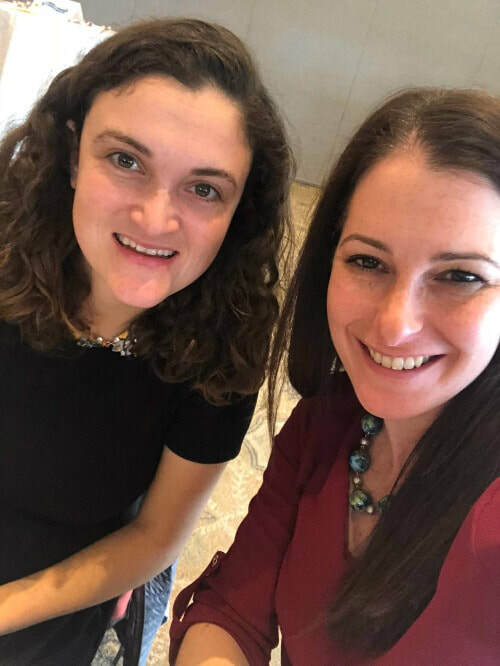 Every time we see a new face at one of our events, I consider it a success because it’s validation that the group’s mission is resonating with people. It also means we’re building our network and our sense of community by meeting like-minded people. Our mission is to empower people to make Hyde Park a cleaner, greener, more beautiful place and each one of our events provides that opportunity. That makes me happy. There are a couple initiatives I’m especially proud of. One is the monthly Humans of Hyde Park series. We shine a spotlight on people who are taking action to keep our community clean, green, and beautiful. We’ve had a lot of fun identifying people to feature, interviewing them and sharing their stories with the community. I’m also proud of the 150 ways you can help keep Hyde Park beautiful list we created in honor of Hyde Park’s 150th anniversary. It wasn’t easy to come up with 150 ideas, but we did it and I’m really happy with the result! I do have a few disappointments. The first is the grant issue, and the fact that we don’t have a list of projects ready for funding. I hate leaving money on the table, when there are clearly so many needs in our community. I think all of Hyde Park’s community groups and organizations should be working together to create a running list of projects, so that we’re all ready to jump on grant opportunities when they arise. Another disappointment is what I would describe as “cleanup fatigue.” It’s depressing to clean up an area and then go back soon after and see it filled with trash again. It makes it hard to stay motivated and to motivate others. We need to do more than the occasional cleanup event. We need more education around this issue, stiffer penalties for littering, and enforcement of those penalties. Oh, and many more trash receptacles on the streets, at bus stops, train stations, and especially in our parks! I’m tired of hearing that this is not a priority. Judging by the number of posts and comments on social media, it IS a priority to so many of us who live here! Could Keep Hyde Park Beautiful install trash cans and keep them emptied? And if you could, would you? I think we could apply for a grant to buy trash cans. As a volunteer group, it shouldn’t be up to us to empty them and I wouldn’t want it to be. We’re not Boston Department of Public Works. They really need to be maintained by DPW, DCR, or whomever manages the property they’re on. As a group we’ve had to be mindful of getting involved in projects that are someone else’s responsibility. We’ve been approached before with certain ideas that sound great, but then we realize someone is already getting paid to do these things, so, the question is, why aren’t they? That’s not a rhetorical question, I actually want to know. If it’s a question of funding, then maybe we can help out. If there are other issues involved, we’d love to help brainstorm and implement solutions. If it’s just mismanagement or laziness, then that’s another story. In terms of the trash can issue, what I’ve heard is that these agencies don’t have the manpower or funding to maintain and empty the cans, and they are afraid that trash cans will encourage dumping from those in neighboring towns, like Milton, that are charged for trash removal and don’t want to pay for it. How is Keep Hyde Park Beautiful funded? We’re funded entirely through donations, which are tax deductible when made through our fiscal sponsor, Keep Massachusetts Beautiful. Hyde Park Main Streets also provides financial support for certain projects and events that are focused on the business district. Funding comes in different forms, not just in monetary donations. We’ve been lucky enough to receive donations of goods (like plants/flowers, tools, gift cards, and items to sell at our yard sale) and services (with local businesses offering their time, trucks and power tools to help us move heavy items and do yard work/landscaping projects.) Southwest Boston CDC has also been generous enough to let us borrow their tools on multiple occasions. It really is a group effort, and we appreciate the support we’ve received from everyone! How does one join and what is required or expected of members? What are the benefits? Everyone is already a member, they just don’t know it! Haha! No, we don’t have a formalized membership program yet. We have a core group of about 15 dedicated volunteers who meet monthly and take the lead on events and projects. Anyone who is interested in being a member of that planning group and has time to commit to working on projects can contact me for more information. If you only have time to volunteer for the occasional event, that’s fine, too! Join our mailing list, Facebook or Instagram page, or check our website for details on upcoming events and initiatives. There are benefits to getting involved on any level. First, you’re giving back to your community and taking an active role in creating the type of community you want to live in. That’s powerful, and I know from experience it can transform the way you feel about Hyde Park. Another benefit is that Keep Hyde Park Beautiful is a positive, feel good group and we have a lot of fun doing what we do. Finally, is there anything you’d like to add? There is so much to be done in Hyde Park, and if we don’t do it, who will? Think about how great our community, our country, our world could be if everyone took an active role in making it so. In a nutshell, find something that needs to be done and be the one to do it. It may be something tiny, and that’s okay. Small, incremental actions add up. If you want to get involved on a larger level, there are so many great organizations to be a part of here. 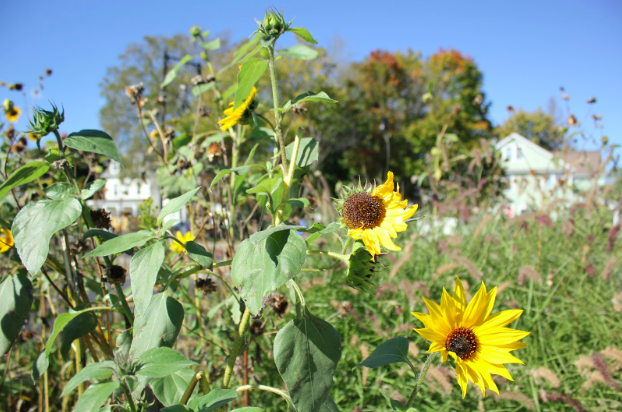 If Keep Hyde Park Beautiful isn’t your thing, check out Hyde Park Main Streets, Southwest Boston CDC, Friends of the Hyde Park Library, the Hyde Park Food Pantry, the Hyde Park Historical Society...the list goes on and on. As Mr. Roger’s once said, “Look for the helpers. You will always find people who are helping.” Let’s all be the helpers! 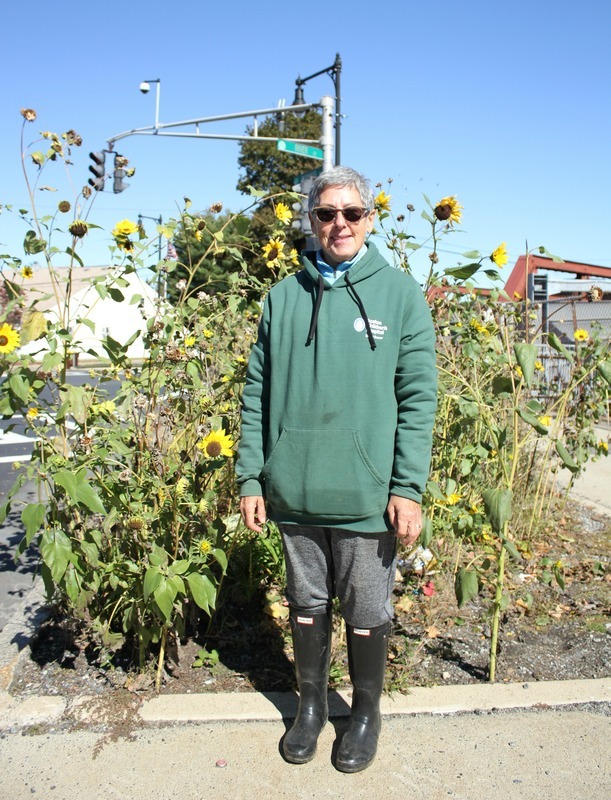 Nancy “The Garden Lady” Savelle maintains the small patch of land at the intersection of River and Business Streets, and has transformed it into a garden filled with sunflowers and other plants. In this edition of HOHP we learn how that came to be. I’ve been in Hyde Park for 29 years. I was a commuter into Boston, and I would walk by the piece of land at River and Business Streets. What was your motivation for starting the garden and how long have you been maintaining it? I would walk by the piece of land and there was trash, and it was overgrown. I really don’t know how long I’ve been maintaining it - it could be 10, 12 or 15 years! ​How did you go about starting it? I called Hyde Park Main Streets and asked if it would be okay for me to take over maintaining the piece of land on my own because it was an eyesore. It took me a season to clean it up and take out the weeds, then I started putting plants in. The first year I would get Boston city trucks stopping to ask who gave me permission and who owned the land. I told them I didn’t know! I think the workers and I figured out it was MBTA land, but the city wouldn’t provide water, mulch, or anything, so I was on my own. ​What is it like maintaining the garden? It’s a high traffic area. Once a week I go up there and clean up the trash. People will stop and talk, and I’ll never forget one young man who stopped. I couldn’t pull out a big sunflower stalk, and I asked him to help me. He asked who pays me, and I told him, “Nobody. I do it because I want to. It brings me joy!” I’ll never forget the look on his face. There was a humanity shift like, “Wow! There’s someone out here who would do something just because.” I think I made a difference in his life that day. In the wintertime it really takes a beating especially from the snow plows; I’ve lost so many plants that way. If they ever have to do work up there and there are guys tramping around, I come out and tell them to watch out for my garden! I don’t go up there that often the way I used to. The garden is self-seeded, and I’ve learned if I put anything too shiny, too unusual, too pretty people will just pick it out. Also the snow plows will kill the right side of the garden. When I first started the garden I was schlepping bins of water, then I got Junior’s on the corner to water it once in a while. Now that it’s established it just sort of takes care of itself. Everything that’s in the garden is really drought tolerant and doesn’t require much care. I don’t have to plant the sunflowers anymore because it’s self-seeded. How do people interact with the garden; do they help? People still smile when they see me; they call me the “Garden Lady.” They thank me and are appreciative. It’s showing love to humanity - some compassion, some joy and gratitude. If I need help - for example to bring a bag out of my car - I’ll wait until someone who looks strong passes by, and I’ll ask them to give me a hand. When I sat on the zoning board there were a few people who were gardeners and there were a few people who would contribute, but it’s trailed off. That’s okay because it’s fine now and the garden is just my thing! Will there be a point when someone else will take it over? ​Not for now, but if that happens I’d let Hyde Park Main Streets or Keep Hyde Park Beautiful know in case they want to take it over. What can people do to help in the community? Just pick up the trash. Don’t do it because you’re expecting a thank you; do it because it makes you feel good about yourself! What do you grow in your own garden? I just grow perennials, and I volunteer at the Brookwood Community Farm. I pick vegetables and they have a CSA over there where you can sign-up and get fresh fruits and vegetables. What do you hope for Hyde Park and do you have suggestions for how people can get involved in the community? We need anchor shops to give people a reason to come downtown; when I was working on the zoning board I could see the tremendous potential of Hyde Park. To get involved in groups like the zoning board look for ads in the paper; get out around the neighborhood and see what’s going on. Get outside! Tell us about your connection to Hyde Park: How long have you lived and worked here and what do you like about the community? In 1996, my family and I were looking for a home. We found a beautiful old house in Hyde Park, that we renovated and moved in to. We chose Hyde Park for our home because of the neighborhood – friendly people, quiet environment, clean streets, and the look and feel of an old-fashioned family neighborhood. I really love the mix of urban and suburban elements, and the fact that it is so convenient for commuting – you can get anywhere from here! We love Hyde Park! 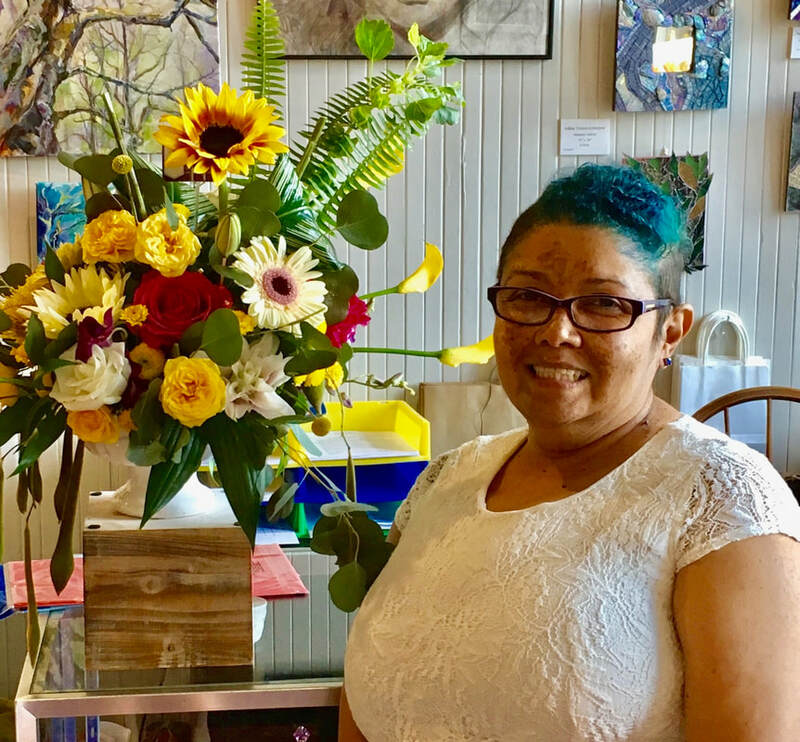 What in your background prepared you to own your own flower shop? I absolutely love our flower shop and what I do, but the truth is this was not my initial choice of a profession. I got into floral design as part of a journey in discovering my talents and gifts. I grew up in Puerto Rico around beautiful plants and flowers, my grandmother had beautiful gardens. However, when I got to college I began to study Forensic Science. I soon learned that Forensics was not for me, so I enrolled in Wentworth Institute of Technology and earned two degrees in Architectural Engineering. I have always loved colors, shaping concepts, creating and designing. Architecture is all about that: design concepts, working with the elements of color and shape. It was and is a great foundation for floral design work. As an internship I worked for the City of Boston’s construction unit on Court Street. Realizing my family needed more of my time I decided to pursue my dream which was also shared by my husband – to design with flowers! It wasn’t long after we began the search for a space which we found right here. Everything clicked: space, permitting, suppliers and all business elements came together easily. We took this as a sign from God! Floral Design was my calling. We are so committed to the call that even though we had a slight hitch with financing where banks denied us a loan because they felt we had no business experience, we were able to overcome it by using our own funds to finance our dream. We cashed in our Money Market account and secured our first location. Pure Joy Flowers (PJf) was born! I’m so happy that I can live out my creative calling. My passion is flowers and my gifts are to look at things with a creative eye and use my skills to make floral visions come to life! God has given me a gift to use flowers to bring beauty, instill joy and express creativity! Pure Joy is a floral design shop! We design, create and use flowers to express the sentiment behind each piece. We are an event driven floral design business – specifically wedding floral design. For this reason, we aren’t often physically in the shop (mainly during ‘Wedding Season’), however, we are working and we are always reachable through our email. We do support many local events: proms, new babies, holidays, funerals, anniversaries…you name it! PJf’s concept is to support Hyde Parkers. We are here because of you! In all of our efforts we are focused on representing Hyde Park and promoting it as a great place to live. This is especially true when we do events in Rhode Island or in towns far away such as the Cape and Bourne. We prioritize helping Hyde Park residents first and even make a special effort to give Hyde Parkers the best prices. Describe the work you do on the planters in the business district and how you choose the plants and flowers to use. We are so grateful that we can continue our service in this way! PJf will always remain loyal to our people! When Hyde Park Main Streets (HPMS) approached me about helping out with the planters I eagerly said yes to the request because I saw it as a way of giving back. To stay in budget and most importantly, support our local businesses, we purchased soil and flowers locally. I wanted planters that were high quality, would withstand the weather patterns and hold water. To purchase the manufacturer’s recommended soil, we reached out to True Value Hardware on River Street. Diane, the manager, was very gracious and gave us a huge discount. After the soil was delivered to my house we rented a truck and my husband and son got the soil into the planters. This took a lot of time and we spread the work out over several weekends. Continuing with our “Keep it Local” motto, we reached out to Beatrice Ferrara of Ferrara’s Greenhouse in Hyde Park, and she gave us a discount on the plants. Maintaining the planters is a team effort. The first summer with the planters was hard for me because I have Systemic Lupus and the sun doesn’t agree with me. Therefore, my family supported me through, along with Thien Simpson and Diane Cylik. Diane and Thien still help and are consistent supporters, plus now we have lots of other volunteers who have been helping with the planting and maintenance. We have also adopted out the planters and have strategically placed planters in front of businesses that we knew would take care of them. Many of the business owners with a planter by their business will clean out the planters. Thien Simpson of HPMS and others water the plants at certain intervals, but now we have a contract with a vendor who uses their water tanks to periodically water the plants. I go around and also take care of the plants, as well. How can the community help care for the planters? My wish is for residents to understand the value-add of the planters: flowers and plants add to the beautification of the area, adding texture and color to the landscape, which gives people a sense of care and pride in our neighborhood. This in turn encourages others to want to visit the area or live here, which enhances our community, and in the long term, increases the property values. There is so much research that tells us that landscaping and beautification communicates that an area is secure and prosperous, increasing property values 12-20% (The Appraisal Institute and Global Garden Friends). Every act of care for the planters is an investment in your community. Don’t throw trash in the planters. I have found whole burritos in planters when a trash barrel was right next to the planter! It is important to respect our community and the efforts of those who are working to keep it beautiful and welcoming. If you see trash, help to keep them clean by removing it. Business owners are great at this, we invite others to participate. Volunteer! HPMS and Keep Hyde Park Beautiful support the maintenance of the planters and ultimately the maintenance and upkeep of this beautiful community. Let’s work together to keep Hyde Park beautiful! Boston-native Dan “The Bee Man” McLean had been suggested for a feature here on HOHP, and I was intrigued to finally meet him after his recent retirement from the Readville Post Office where he was known not only for his service but for his excellent honey. Here’s the story of his beekeeping journey. Tell me where you grew up in Boston and how you became interested in beekeeping? I was born in Southie and grew up in Dorchester and have been a beekeeper since 2009. I like to garden and about 10 years ago my daughter signed us up for a beekeeping course together at the Norfolk County Beekeeping Association. I took the class with her, and I was hooked! It was like a father-daughter activity. I got certified with beekeeping and everything took off. 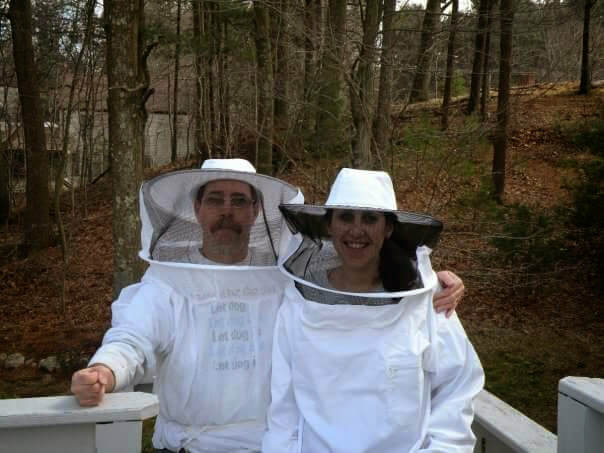 I started with my hives in Sharon where I live and working at the Readville Post Office I had an opportunity on my off time to check out the surrounding areas of Hyde Park, Milton and Dedham. By word of mouth, people started to find out about my honey and people started asking if they could have hives on their properties.I check if their properties are large enough so that we barter the land for the beehive and I also do hive rentals. 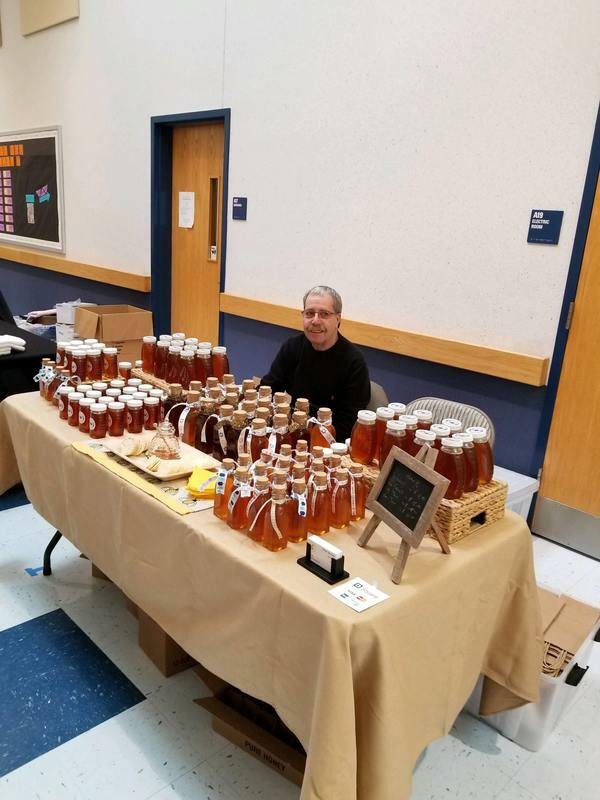 I’m currently selling honey at McCrea’s Candy, BC Bakery [on Como Road], and the Dedham Junior Women’s Club Craft Fair [coming up on November 17, 2018], Chickadee Seed and Feed, the Dedham Women’s Exchange. My coworker Mary, and I didn’t just sell stamps at the post office; we were gatekeepers. People came in to tell us about their lives - we were sounding boards. It was a good place to work that way, and it made me feel good. What I love about this area of Hyde Park and Readville is that I get to see such a crossroads of people. Will you pass your business on? At this point I’m not sure, but Norman Shaw was a longtime beekeeper in Hyde Park, and I inherited his bee yards. He was a fantastic mentor! Having him as a mentor kind of infected me with the desire to become a beekeeper, and I’ve been fortunate to keep McCrea’s on as a partner. If someone wanted to learn about beekeeping what would they need to do? Is there continuing education? ​Pay for a course and then get certified through the NCBA. There are monthly meetings that keep beekeepers updated on ongoing issues. We also have speakers that come. Every county in Massachusetts has its own beekeeping association, and there’s even a world apiary congress. How time consuming is beekeeping? You can’t step away from it, but I try to check my hives every 2 weeks. If you want to be a beekeeper you don’t want to go down to the Cape for the summer! You have to consider how big you want to get. I’m retired so I have to consider that. Am I going to be here for a few years? We all have family situations. It’s big enough that I’m happy with it now. You can make it as large or small as you want. It’s scalable. There’s been news about the decrease in the bee population. What is currently happening? The varroa mite came to us in the ‘80s via Asia and devastated the European honeybee populations. The thing is there’s nothing effective to fight them, but there’s a lot of natural methods to treat them. I don’t use the word “organic” because we manage beehives, they’re wild creatures and go between a 2-3 mile radius so we can’t tell their flower sources. We’re fortunate that here in Hyde Park we don’t get harmful spraying; the closest thing might be mosquito spraying in the spring. The flower source would have to be very isolated to be considered organic. We can never eliminate the varroa mite, but we can reduce their population. Seasonally what do you have to consider? At this time we’re into the autumn cycle, and it’s one more honey push that’s standard to the weather. At this time goldenrod and Japanese knotweed are the two flowering plants that are making a richer, darker honey. There are different florals and different flavors. That’s why local honey is so good. ​Nominate yourself or someone in the community for a future Humans of Hyde Park story; nominees can remain anonymous in the story or use their first name only if they prefer: https://goo.gl/forms/qgTj1Rh8t2bSbh973. 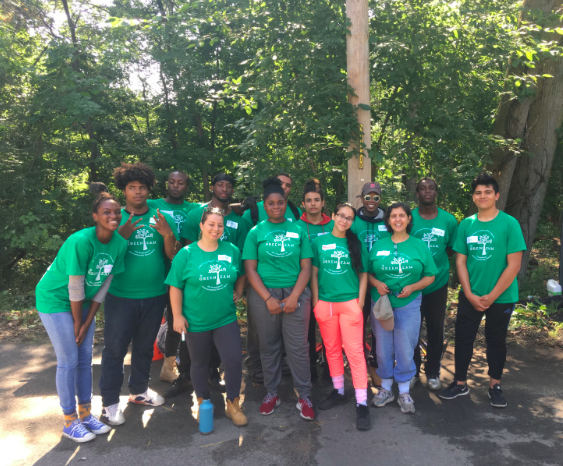 For this month’s Humans of Hyde Park story, we’re featuring the Southwest Boston CDC Green Team, a group of Boston area youth who focus on advancing the preservation and improvement of local green spaces. The Green Team, which celebrated its 10th anniversary this year, is a annual six week program that provides summer jobs for local teens and teaches them how to care for wild green spaces in their city. Each summer, under the direction of Program Director Pat Alvarez and Program Coordinator Whitney Ligonde, and in partnership with the Boston Parks & Recreation Department, the team spends about 70% of their time on neighborhood and urban wild work projects and 30% of their time on job readiness training and environmental education. The program begins with two days of safety and job orientation training and then later in the program there is additional training in areas such as personal finance, community outreach, workers' rights, resume and cover letter preparation, higher education and career options, climate change, water protection, and more. Through this program Green Team youth develop leadership skills; a sense of responsibility for their community; knowledge and interest in the natural environment and a range of job readiness and life skills. We recently sat down with members of the Green Team to hear about their experience with the program and to thank them for all their hard work this summer. Tell us about the Green Team: what it is and what you all do? Ricardo: The main mission of the Green Team is to restore the urban wilds - Sherrin Woods and Dell Rock -to make it more pleasing for people to go into Sherrin Woods. Tashaina: We do community outreach and volunteer events to teach people about Sherrin Woods and how to take care of it. What was it about the Green Team that made you interested in applying for the position? Da’Sonté: I’ve been working with kids for a long time and when I saw this I thought it would be something new, outside my comfort zone. Trying something new, becoming one with nature. Myeniza: I was interested in the career training that we do. Zion - This is my 2nd year with the Green Team. I liked it the first year. We work as a team and we work hard every day, finishing our tasks. I like getting to know everyone. Last year we became like a little family. Tashaina: We learn about nature. I was excited about the training we would do, the seminars and learning about career opportunities. I also wanted to help where I live in Hyde Park. Make it nicer than it was before. Tell us a little about the training process you went through. Zion: We learned about bike safety - we ride our bikes everywhere to the different sites. We also learned how to identify plants like poison ivy. I knew about poison ivy, but I never knew what it looked like until I started here. Ricardo: We also learned about tool safety and what to wear. Tashaina: Working together as a team, responsibility, respect. Zion: The number one thing is communication - it’s so important or nothing gets done. What have you been working on, and what are your overall goals for the summer? Ricardo: We're working to get rid of the invasive plants in Sherrin Woods. We’re also trying to finish up a trench in the forest. Myeniza: We’re digging a 3 foot x 4 inch deep trench along Marston and Austin Street. We’re digging out dirt and rocks, covering with a weed guard and putting dirt and mulch on top. We’re trying to make it look nice for people entering the woods. Da’Sonté: The invasives we’re trying to get rid of are Garlic Mustard, Buckthorn, Multi-thorn Rose, Burning Bush. They got there from people dumping construction and landscaping debris at the site. It throws off the PH of the soil and allows other plants to grow. What is the most interesting or surprising thing you learned or found? 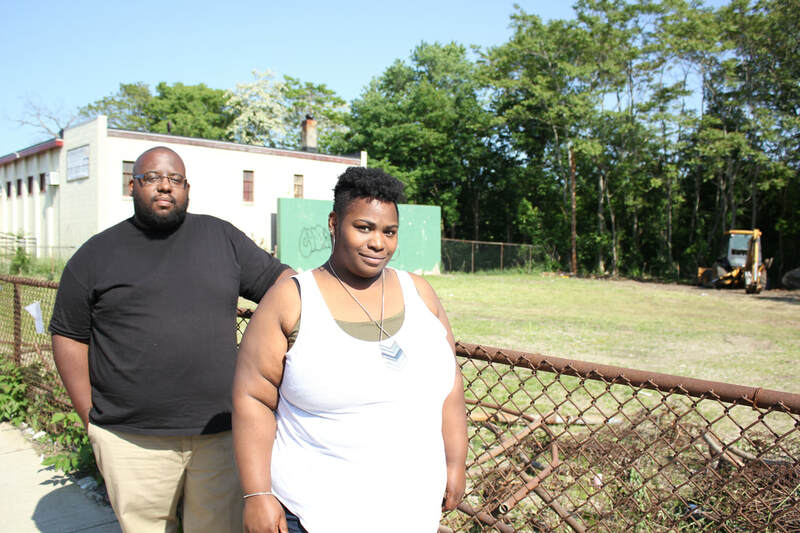 Myeniza and Da’Sonté: We wore hip waders and went into the Neponset River near Edgewater Drive to see if the river is clean. We were looking for different things like different species of animals that are sensitive to pollution, like invertebrates. If you find invertebrates, it means the river is in good shape. We found crayfish and mussels, which was a good sign that that section of the river is healthy. They can’t survive in polluted water. Da’Sonté: We found a salamander in Sherrin Woods that’s endangered. It breathes through its skin so we had to be careful that we wouldn’t suffocate it by holding it. They also can’t live in polluted areas, so it was a good indication of the health of the area. Tashaina: I didn’t know there was a plant called Jewelweed. You open the stem and rub the sap on your skin and supposedly it will stop the itch from Poison Ivy. What is your favorite part of being a part of this team? Da’Sonté: Meeting and working with new people of different age ranges. Some of us are 15 and some are up to 19. Ricardo: Sometimes when we’re working we start talking to each other and we talk about interesting stuff. It’s entertaining. Tashaina: Like Zion said earlier, we’re all like a little family. We all get along for the most part. I would definitely recommend this program. This is my first job and it’s amazing - way better than working someplace like McDonald’s. Da’Sonté: There’s a lot of blood, sweat and tears working in the woods, but it is worth it. No pain, no gain. Tashaina: It is definitely worth it. How do you think this opportunity has changed you? (in terms of your perspective on things, your skills, etc). How do you think you will be able to use this experience in the future? Da’Sonté: I feel less stressed being in the woods. I actually want to take walks in the woods now with my dog and be one with nature. Celine: I didn’t even know Sherrin Woods was there and I live close to it. I’ll visit more often now. Alan: This has made me want to go outside more often. I used to stay inside all the time. Tashaina: It’s helped me with public speaking and working in groups. I’m a lot more confident and independent. I’ve also developed more of an appreciation for the woods. I always loved nature, but now I can identify stuff and show it to my family and friends. Do you have a message you’d like to share with the community? Ricardo: Don’t litter in the forest. If you have trash, use a trash can. Recycle. Tashaina: How you treat the woods will one day affect you and all of us. Da’Sonté: Treat the woods like you would treat your house. Keep it clean. ​How long have you lived in the community? I used to live in Milton with my family for 5 years up until last fall. 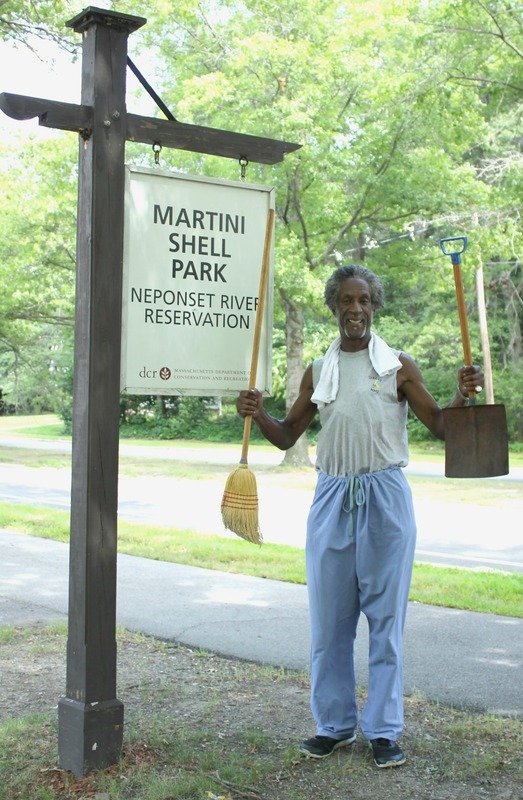 How did you decide to clean up Martini Shell Park? I was in the area and in the spring of this year I would pull up in the mornings and would notice litter all over the place. I wanted to get a little exercise and would get about 45 minutes in. I carry a broom in my truck so I figured I could clean it up. Does anyone join in or ask questions as you’re cleaning? Yes, I get plenty of “thank yous” and appreciation hellos. People walking the path would give me a thumbs up! The workers pick up the piles that I make and it makes a little less work for them. What do you see happening next with your clean up project? Will you start cleaning other areas? I’m not interested in other areas; it was by chance that I happened to see the litter here so I clean it up. I don’t go from park to park doing this. It’s just an area where I often park, and I noticed it was generally littered. My last name is Wood, and I remember Woodsy the Owl which brings to mind the old Keep America Beautiful campaign so I kind of “Woodsy the Owl-ed” the area! How can the community help? I don’t need a big group of people here in Martini Shell Park to help; now that I’m there the town comes by twice a week because I leave piles there that need to be picked up. I think it’s a good idea for people to start cleaning up in their own area! We could use some supplies though - plastic bags and things like that [email KPHB to get in touch with Mr. Wood]. Do you ever see people littering while you’re there in Martini Shell Park? When I arrive in the morning it’s there from the night before, and I’ll notice cars just throw stuff out the window. There’s only one trash receptacle, but it’s not near the parking lot. They do need trash barrels. It would help if they were closer to the parking lot so those in the cars wouldn’t have to walk so far to through their trash away. I understand you’re an artist. Tell me more about your work. I’ve been drawing since junior high on and off, but I consider myself a watercolor artist; for me it’s turning out a greater event than I actually thought. When I paint it’s like being in a tunnel until I finish. I primarily draw in the winter time in the library. I have so much work; I draw in such volume that you can’t tell that I’m only drawing in the winter. I’ve been on hiatus, but I will be starting again. I’d like to get my art out to sell, but for now it’s in storage. The restoration of Doyle Playground on River Street has been prominent news lately within the community. In this edition of HOHP we’re highlighting two key leaders in this project which is fundraising now through June 6, 2018 with donations being matched by Mass Development. You can make a donation here. How long have you lived in Hyde Park and what do you do? Lawrence: I am a freelance graphic designer and have lived in Hyde Park since birth, minus 3 years in Jacksonville, Florida. Arielle: I have lived in Hyde Park for almost 30 years. I was born and raised in the same house, and only left for college. I do a whole host of things, but what’s most important to me is that I am a singer/songwriter, and YouTuber. How did the Doyle Playground project come about and how are you involved? Arielle: Before POHWER (People of Hyde Park Wanting Equal Representation) became what it is today, SWBCDC (Southwest Boston Community Development Corporation) had a community clean up at Doyle. When talking to the neighbors that came out to participate, they learned the concern for that lack of care at the location. This is when we chose as a group of community members to find out how we could work with the state to renovate the space. As a lead member of the project, I have been a part of meetings with DCR to learn what could be accomplished at Doyle, and also organized community visioning days. Lawrence: I wasn’t able to go [to the clean up day], but I went to the second meeting before the group was named POHWER and have been involved ever since. Arielle: Lawrence and I are both members of POHWER and leaders in the effort to restore Doyle. Lawrence is also family, so we both know what Doyle used to be from playing there as kids, and are excited for what it will become. What excites you most about Doyle Playground? Lawrence: The chance to see a playground that I used to use as a child, that was neglected, find new life is pretty exciting. Arielle: I have lived next to Doyle my entire life. I watched it turn from a place I used to play in to an abandoned dump. It was sad to me because it matched how I felt about living here, but to now be a part of the restoration of the space gives me hope that there is new life being poured into Hyde Park. How can your neighbors help with the project? Any neighbor is welcome to come to our POHWER meetings to learn more on how they can directly help with Doyle (follow the Facebook page to stay informed). The meetings are held every 4th Thursday of the month at 11 Fairmount Ave (in the SWBCDC office). If they do not want to directly be involved, they can donate to the cause through our Patronicity campaign. This project is not just about us or POHWER. Doyle belongs to every person that lives in Hyde park and we want it to be a positive reflection of that. Beyond Doyle Playground, are there other future projects that you’re involved with? Lawrence: The POHWER group and I are a part of a few projects right now, some of which are focused on affordable housing, and getting the Fairmount commuter rail line to run more reliably. Arielle: Yes! But to find out more, I'd suggest neighbors come to our meetings. I would not do any justice talking about all of the great things going on here. Truthfully though, I have learned while being a part of POHWER that the people are truly the heartbeat of the community; and without our voices, there is no life. Doyle is just a reminder of this. There is a place for every voice to be heard in Hyde Park, and we want everyone to see this.